An easier week in terms of the past 15 weeks, but I still had some struggles. My body’s immune system is down and I’ve felt pretty run down. Luckily I feel better now, but this week had a few tough days. Five morning miles on tired legs. I wasn’t as sore as I expected, but I still didn’t feel great. I was just happy to get the miles done early! Five morning miles where I couldn’t slow down. I just had something in me that made me run fast. I decided to just go with it and enjoy the morning. After work I did a cycling class at Studio Three. 45 minutes of sweat! Woke up feeling really sick and never got better. Decided to move my rest day up and let my body recover. I still wasn’t feeling great, but I wanted to run. Went out for 4.5 evening miles with Kyle. We get the pace easy and just chatted. Actually ended up going farther than I wanted, but that’s okay. I finally got my last 800m workout in! 8.80 miles total. 8:43 average with 90 second rests between reps.
Last real long run! 12 miles at 9:07 pace. I met up with Carly for 8 of the miles and pushed a fast finish. Last two miles were around 8:20. My legs were tired from my speed workout the night before, but I still felt strong. An amazing morning spent at Wrigley Field. One hour of yoga in the sunshine on the grass. I absolutely loved it! And my legs will thank me for it. Taper is taper and I’ve had some phantom pains and freak outs this week, but I’m trying to remain calm. Still got in all my miles even with being sick. I’m hoping I got my sickness out of the way and that these next two weeks are a breeze! Not a lot of miles left to log before race day. Sixteen weeks down, two to go. Taper time is here. And that means I get a little crazier than normal. I know tapering is a necessity and my body will thank me come race day, but ACTUALLY tapering can be tough. I get in my head and stress myself out. And I know I’m not alone. Decided to share my taper thoughts incase anyone can relate. “Wow I haven’t run in days.” (It’s been one). “I’m so hungry.” (Ate one hour ago). The reality is…I’ll be fine. I know I’ve put in the work. I just need to relax (which is easier said than done). My body is fine. I will get over this cold. I will follow my reduced mileage. I’ll deal with my crazy thoughts and try to put all my energy into focusing on a successful finish line. I’m so close. And I cannot wait for October 9th. This week was my last high mileage/high intensity week before tapering, so I enjoyed every minute. I’m ready to taper, but I also know that I get the taper crazies, so I told myself not to rush this week. Enjoyed the higher mileage while I still could! 3 miles in the morning and then 2 miles in the evening right before Flywheel. Tough workout, but it felt great to sweat that much. Today was a day trip to STL. 5:00 AM wake up call, 7:55 AM flight, full work day, 6 hour train ride home. It didn’t leave me any time for running, so it had to be a rest day. I needed this speed workout this week. A week off felt like a long time. And I LOVED this ladder workout we did. Every rep except for one was at sub seven minute average pace. We crushed it! I went out for five easy miles with Kyle after work. They were faster than planned, but he was in the mood to run fast, so we did. It was a perfect evening! I slept in a little later than planned, so I had to cut my run short, but I was still happy with 4.5 miles. 7:58 average pace and a perfect start to Friday! The third and final 20 miler was my best one! Stuck with the 8:30 pacer and finished with an average pace of 8:29. Really proud of this CES run training run. It was fun to run with a group and the weather was just about as nice as we could have asked for! Took it easy today and just did 20 minutes on the bike followed by 10 minutes of incline walking. My legs are sore, but honestly not as bad as I expected! The hard work is done?! I’m shocked by how quickly these fifteen weeks have gone by. They weren’t easy, but I’m proud of my effort and ready to enjoy this taper over the next three weeks. Fifteen weeks down, three to go. Week fourteen was all about being adaptable. I didn’t exactly stick to the plan, but that’s okay. Sometimes life happens. And thankfully it was a cut back week! Having the day off was great, but my legs were super sore from Sunday’s 20 miler. Kyle and I set out to run a few miles and ended up stopping after one. My legs were not feeling it and I decided it was better to call it quits. Travel to Cleveland day! Had to get up at 5:30 AM without a workout and had a full day followed by a night networking event. There was no time to run, but I was on my feet a lot at least. A 14 hour conference day that began at 7 AM. I had one hour to myself after dinner (at 8 PM) to log 3 miles on the treadmill, shower again, and head to a networking party. It wasn’t much, but at least it was something. Another crazy busy day. I was just completely exhausted. Got home at 11 PM and gladly crawled into the hotel bed. Rest day was the only option. On Friday morning I finally had a chance to explore Cleveland! I ran 8 miles through the city with no real plan. I was so antsy to run after a stressful week with little mileage and it felt great. I even enjoyed the hills! Finally back in Chicago, I met Carly for our long run. 12 miles at 8:53 average pace. Ran two miles solo to meet her, 8 together, and another two solo back to my place. We had a lot to chat about and the miles flew by. I felt great and enjoyed “only” having to run 12 miles. Kicked off Sunday with a Hot Power Yoga class at Studio Three in the morning. I was a little nervous, but I liked the class more than I thought. I sweat A LOT. But I definitely felt better after I left. Then went out for some recovery miles with Kyle around 3:30 PM. We did 5 miles at 9:01 average and enjoyed the beautiful weather. A Sunday well spent! This week was tiring and I did not run as much as I would have liked, but I had to attend this conference and didn’t have much control over my lack of sleep or 14 hour days. I’m proud of what I did get done and how I handled my weekend. And I’m feeling relaxed and ready to take on one more difficult week of training before taper! Fourteen weeks down, four to go. The Final Countdown: An Alcohol-free Month. We’re officially one month away from the Chicago Marathon as of tomorrow morning. Yikes. I’m ready, I know I am, but the past 14 weeks have gone by so quickly. Even though I’ve been crushing my training, it still feels a little bit like it snuck up on me. As part of this final month of preparation I have decided to go alcohol-free. I’ve always done one or two weeks of no booze leading up to my past few marathons, but never a full month. I’ve also never tried to BQ before. Basically, I don’t want anything to get in my way at this point, so I’m doing a booze-free month. I spend quite a bit of money at happy hours, on nights out, etc. And I’ve been feeling extra broke lately, so this will be a good way to save a little bit over the next month. 2. No late night food. Drinking at night usually leads to a stop for food on my way home. With marathon training I’m always hungry regardless, but after a few beers I can always convince myself that I deserve some french fries. Not that there’s anything wrong with this, but I know that without drinking I can make sure I don’t make any late night Portillos stops. I know that by not drinking, I will stay up late less often. And any reason/excuse to get to bed earlier is one I will take. I know my body will need the extra sleep over this next month. I know booze doesn’t contribute to my training, but man do I love a cold beer after an occasional long run. I just don’t want to hinder my chances in any way. I’ve worked too hard. Without imbibing my body will recover quicker and I’ll have more energy. I’ll feel better knowing I haven’t put any bad substances into my body in a month when I get to that start line. If you know me, you know I LOVE a good beer. Or a glass of wine. This will be tough. I don’t think the lack of going out will be tough, as much as the no wine with dinner or no happy hour drink. But what’s one month? I know I will feel better after doing this. 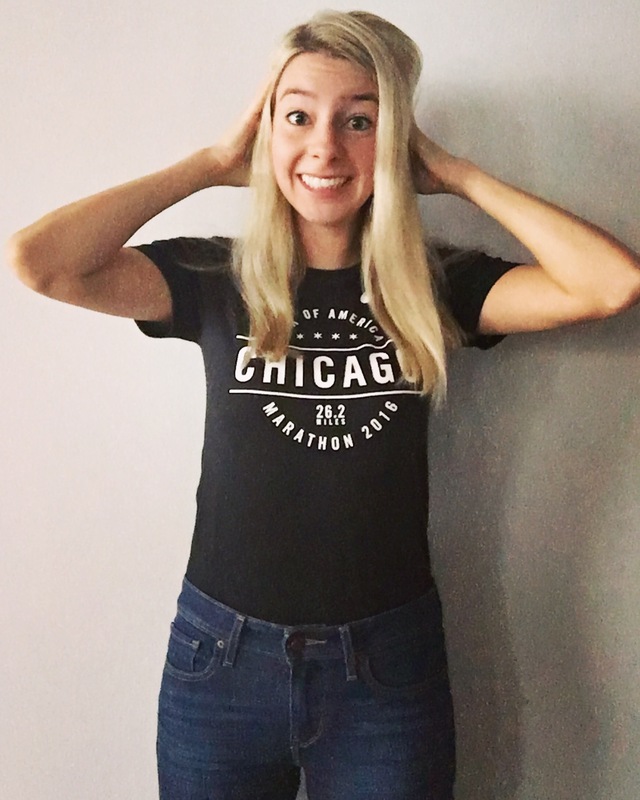 I want to be in my absolute best form when I toe that Chicago Marathon start line. And this will make that post-race beer even better. Cheers. Week thirteen was peak week for me. The highest weekly mileage I’ve ever run, plus tough cross training workouts. My legs are dead, but I can’t wipe the smile off my face. Working hard for something truly makes me a happier person. Couldn’t wake myself up in time to run early in the morning, so I ran right before my Flywheel class. Five relaxed miles with 15 minutes to spare before class. And then I hit a new Flywheel PR with a power score of 285 (much higher than I’ve ever hit). I think running right before actually loosened up my legs and I felt great! Got in 3 easy, rainy miles in the morning. Then had a Torch class at Studio Three in the evening. An hour of running, rowing, and strength intervals is tough, but I felt strong. I love this type of workout. And I covered 2 miles during my treadmill intervals which brought me to 5 miles for the day. This weeks team speed workout was 600 meter repeats. 10 reps with a 200 meter recovery jog in-between. It was finally a little cooler out, which I think helped us hit our paces. All reps faster than 6:58 average? After a two double workout days? I’ll take it. I was pretty proud of this workout. These speed nights are one of my favorite things about training. Much needed planned rest day after three hard days! Having a 20 mile race on Sunday meant I just did 2.15 shakeout miles with Kyle this morning. Ran at an 8:30 pace and ended the run at our favorite coffee place. Perfect way to start the day! And my legs felt good. Jen and I went to Milwaukee for the weekend for the Lake Michigan Marathon. They offered a 20 Mile Training Run as well as a full, a half, and a 50K. The 20 miler was only $20. No medal, but we did get a shirt! This trail race had some of the most technical trails I’ve ever run. Miles 5-9 were on single lane trails, including stone stair cases and some hopping maneuvers. I was with a pack of fast men, so I felt a littl anxious and got nervous the whole rest of the race was going to be like that, but it wasn’t. It opened back up again and included some pavement. It was hilly and beautiful. I honestly felt strong the whole time. Even felt like I could have gone the full distance today. I’m so glad we decided to do this race. 20 trail miles at 8:54 average pace. If I can do this race at that pace, I think Chicago will feel like a breeze (let’s hope). But I had a great time. I can’t believe peak week went by so quickly. 50 miles in a week?! I didn’t know I had it in me. But I feel good. Sure, my legs are really heavy right now and I’m not looking forward to walking up and down stairs tomorrow, but I’m happy. This is the best training cycle I’ve ever had and I’m getting more and more excited for race day with each passing week. Thirteen weeks down, five to go.